After my junior year, I managed to score a bullsh*t senior year when I took only one real high school class along with some community college courses. Sometime during that year, I re-learned how to listen. I remember realizing, somehow, that I was becoming insufferable in conversation. And once I had succeeded at eliminating busywork and dramallamas from my everyday life, I caught up on sleep, stopped living like a narcoleptic, and discovered that the world around me had fascinating truths to impart to anyone able to put their hand down and listen for a stretch. Then, like every child of the dawning internet age, I became addicted to mainlining digital information to enrich and explore the wisdom of the RL. Identity politics! Regular politics! Social memes! Trends in psychology and medicine! I followed along intently as life's mysteries were uploaded, tagged, and analyzed in minutest detail. I had never been so informed! Then 2016 hit me like the goose that broke Fabio's face in '99. The interwebs had failed me. Scores of my favorite bloggers, reporters, and data analytics systems turned out to be dead wrong about big stuff. Since fall, I've felt an instinctual call to sit down, shut up, and listen in a careful, mindful way--not to the intoxicating white noise of electronic media, but to the pulse of the secret counter-revolutions, the paradoxical social reactions, the quiet bone-knittings and epiphanies and volcanic rumblings beneath the surface of all the alternative facts and true lies shocking and awing the masses. That goose slapped me right 'round to a different perspective. And I'm not the only one. Underneath the media's trumpeting, I see people all around me tuning out, unplugging, and stretching atrophied muscles to look around themselves, stunned and curious as Neo awakening from The Matrix. This is not business as usual. Together, we are being reborn into a new age of understanding truth and meaning. This is no time to run blindly in any direction, guided by impulse or common knowledge or authority. We're not in Kansas anymore. For a writer or other artist, this moment is a unique opportunity for creation. Writers, now is the time for butts in seats. If you need any further reasons why or advice on how, behold this collection of famous authors' responses to the events of 2016 in The Atlantic. But, seated writers, beware the trolling, distracting, misleading media while parked in your chairs. I feel an urgent need to focus and pull out another cliched skill I learned in college: mindfulness meditation. I've scheduled an hour or two a day for creative writing and related activities (like focused research and critical reading). My best creative writing is not reactive. It's not Tweeting or commenting on Facebook posts. It's not expounding on a thesis (although that can be creative, too). My most healing, productive, enlightening work comes from getting into the zone where my conscious mind takes a backseat to the thrilling, groovy, wild ride of a subconscious flight through neural storms. I find that I can get into that zone much easier when I've had my quota of forest bathing and exercise. There is no substitute for physical activity when it comes to optimizing brain function. Right now Michigan is fluctuating wildly between wintry blizzards and summery days, and I am glued to my weather app--I mean, of course, my living room window--on high alert to take advantage of family bike ride opportunities! We have this gorgeous path (pictured) that goes through parks, meadows, and woods, from our neighborhood directly to the farmers' market grocery store with a beer garden. I am so excited about the intermittent spring! I am no longer making the slightest attempt to attend academic lectures, watch TED Talks, or march in protests. This is not because I don't support those things, and it warms my heart and fills my soul with hope that so many people I know are suddenly moved to make signs for rallies, discuss complex social issues, and buy up every ticket to the Ta-Nehisi Coates presentation and the forum on mass incarceration. It's amazing and beautiful. I'm also not suggesting that I already know everything there is to learn from those activities, because no one ever gets to that finish line. My personal turning-away from intellectual and political statement formation is a turning-toward more intimate personal connections in my life. I've spent years studying and crystallizing political and social ideas and strategies, to the extent that my personal relationships have suffered. I've inadvertently hurt the feelings of friends and loved ones whose plights I've been studying academically, and I've taken "best practices" too far and applied political correctness inappropriately. Behavior that is courteous to a stranger can feel cold and hurtful when applied to a close friend. Personally, I feel the need to turn my attention, at this time, to the individuals in my life, who are far more than the sum of their demographics. Every human being has a beautiful, unique mix of feelings, experiences, needs, wounds, and gifts. I tend to get so caught up in big-picture conversations that I forget to attend to the open hearts of my friends, who prefer my flawed realness to overly cautious politeness. As an introvert, I'm also trying to challenge my comfort zone and keep my heart and mind open to the particular people I find around me by chance, like neighbors and new coworkers. I value forming connections with people who are not relatives of mine, and whom I did not freely select as companions. Sometimes those professional and neighborly connections even grow into friendships. This week, some folks I know attended lectures, lobby days, and politically charged performances. For some of them, those sorts of activities are new and exciting. I was able to do something new and exciting for me personally by attending the private Naming Ceremony of a baby born to my neighbors, whose eldest daughter has befriended my daughter. 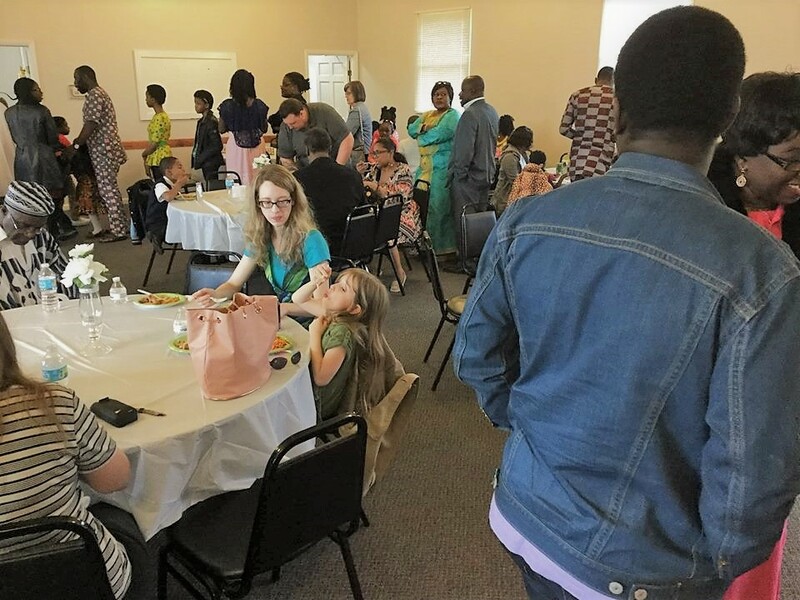 The ceremony is part of a Ghanaian tradition, and the attendees included loved ones from several African diasporas, long-established African American families, and others connected by friendship and marriage. I am no longer talking through lectures to stay awake. I am no longer scheduling my own classes. I am attending to the personal relationships I've let slip due to the isolation of early motherhood and the distraction of long-form listicles. I'm preserving my time and energy and leaving my door and my calendar and my heart open, so when a friend wants to show me Lemonade and another friend wants to rant over a beer and a struggling acquaintance needs a ride and a child wants a safe place to play for a few hours and a neighbor wants to invite me to an adorable, delicious, musical, loving family ceremony, I can say YES and accept a special kind of educational and spiritual nourishment by taking a seat as a guest at someone else's table. In case you didn't notice, I am a middle class white woman. I work for an organization made up of mostly educated white people, which is highly engaged at the moment in attempting to address issues of racism, classism, and other forms of oppression in ways that effectively dismantle them. Some people roll their eyes and laugh, and some privileged people get defensive about the mere attempt to act with mindfulness of one's privileges. But I believe it is an admirable and worthy goal. So I'm trying to do my best work by listening deeply and taking on an unconditionally supportive role to those whose barriers I do not share. I feel good about using my own set of powers responsibly by practicing trust and open-mindedness and getting behind the initiatives of others without trying to steer the boat. To be clear, I feel the need to press myself into a supportive role not because of a moral stain on my political or social identity. I do not believe in original sin. I do not believe in "white guilt." I recognize the reality of shame and how it metastasizes in afflicted white people, and I have worked hard to heal all kinds of shame in my own psyche. I am taking a back seat at work not because I do not deserve to lead but because everyone recognizes the value of a native guide to the terrain or a native speaker to the teaching of a language. It is not a moral judgment but a practical one. In gratitude for being invited to the table by so many generous people in my life who have chosen to share the beauty and power of their struggles and joys with me--unearned on my part, given as a gift of grace--I am happy to invite others to take the wheel of my privilege yacht while I follow directions and provide support. Doing so is one more way for me to learn and grow in relationship with others--to stay in touch with the realities of human life and love and pain, outside of the bubble of delusions I could live inside if I were not so darn curious about reality. I am aware of the irony that this has been a long and wordy post about living less intellectually and spending less time online. Better out than in, I say! Also, it's okay, because I love irony--especially when Sesame Street tells kids to stop watching TV and play outside or when I see posts from that Hands Free Mama blog. Yes, it's funny, and yes, there can still be legit value in going ahead and expressing critiques of a medium in the medium being critiqued. Absurdist jokes. Paradoxes. Zen koans. The rise of Donald Trump. They don't make sense, but they sure make you think.